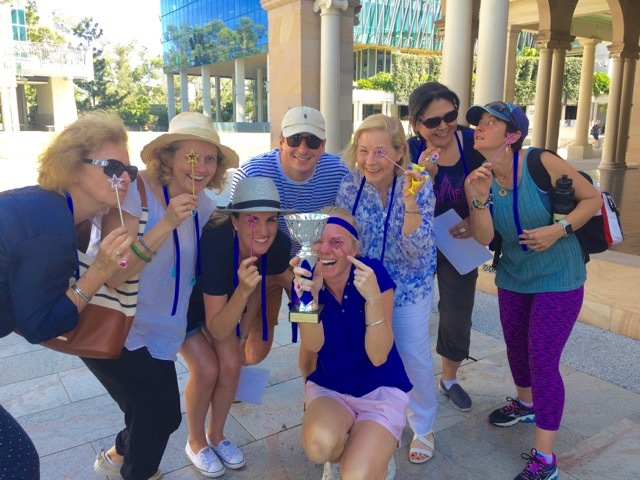 Brisbane Amazing Race features the best selection of group activities and fun for everyone to get onboard and win the coveted Amazing Races Trophy. Explore Brisbane, Botanic Gardens, Southbank, GOMA and wonderful pubs in time for work party Christmas celebrations. 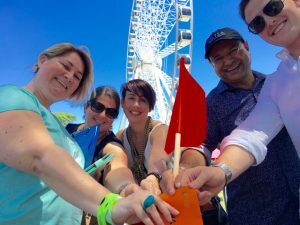 Get on board for a brilliant Brisbane Amazing Race team events packages that are perfect for active groups, corporate events, team building activities and social groups exploring Brisbane. Race or walk through the CBD, Queen and Anne St, King George Square, Anzac Square, Eagle Street Pier or The City of Brisbane Botanic Gardens. We also roam to; Roma Parklands. Visit Southbank Beach, GOMA, Maritime Museum, Kangaroo Cliffs. Over The Brisbane Wheel, out to Kangaroo Point. Impress your staff, employees, ceo, colleagues and friends with a premier Brisbane team event. Your skills, knowledge, talent and teamwork will be tested in a race to win The coveted Amazing Race Brisbane Championship Trophy. Ideal for Corporate Team Bonding, Business Teams, Rewards, Incentives. Or just a great time together for Social groups, Hens and Friends. Amazing Races are exclusive group events. Your groups will be divided into equal teams and provided with a race kit. Amazing Racers in Brisbane may travel by foot, taxis, Brisbane Ferries, trains, bikes, water taxis, uber, cars. Even Kayaks, Segways or Jet Boats for the Ultimate wow factor! More exciting inclusions like Hummers, Story Bridge Climb or even Cooking and Pole Dancing if your team dares, can be included. Starting from all Brisbane conference venue, office or workplace – all function centers, conference venues, hotels and business offices. Your team will receive a briefing by our professional host and coordinator; your very own Phil Keoghan stand in’s. “Loved our Brisbane Amazing Race! Explored and raced to many Brisbane gems and learn’t lots more than we bargained for”. Join the real Amazing Races team in Brisbane team for a series of fun team building activities, challenges, tasks, detours and road blocks! Enjoyable, exciting team building, team bonding or social friendly competitions. Put the challenge to your mates and test to see who is going to win! – cost effective, short duration from 2-2.5hrs immense fun! – 2-3hrs revealing Brisbane’s secrets! 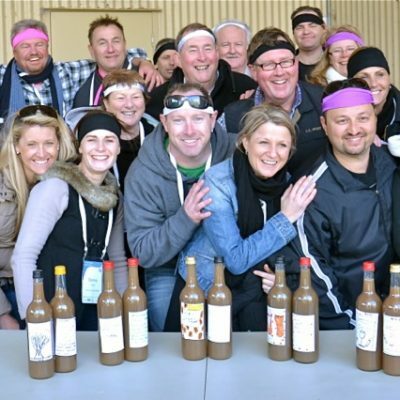 – Most Popular for corporate groups team building! Around The Botanic Gardens, Southbank, Along the Brisbane River, Enjoy some Byron Chocolates. Visit historic buildings, modern QUT technology, Maritime Museum and GOMA Art Gallery… fun amazing race challenges that develop teamwork. Up to 14 activities in and around Brisbane CBD which can link to Fortitude Valley, New Farm, Mt Cootha and down to the Gold Coast, Surfers Paradise beaches and Kingscliff Resorts. As well as out to Byron Bay, Mt Tambourine and the Gold Coast Hinterland. Providing all the bells + whistles of a high quality Brisbane team building activity or event that is bespoke. Guaranteed to delight your teams, delegates, incentives, special events and VIP’s. 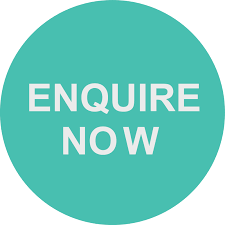 Request amaze me in Brisbane and be delighted with; Storey Bridge Climb, Brisbane Wheel, Abseil, Cycling, Paddling, Segways, Helicopters, Jet Boats, Ferries, Dolphins at Tangalooma, Eating wonderful foods. Integrating team communication, problem solving kills, strategic planning and using common sense collaboratively. Suitable for all corporations, departments and abilities. We match your pace and select challenge activities that will have everyone involved & engaged. Timing advised for BRISBANE Races is a minimum of 2 hours, with 3.5 hours being optimal for a quality team bonding, team development exercise or team building activity. Staff customise all content to match your requirements form start at any location and finish at any destination. Presentations and awards professionally hosted. Contact us for a free team building activities assessment or social group event quote and receive amazing races free offers. * Excellent Amazing race checkpoints with activities that are worthwhile to accomplish. * Experienced and professional staff at all team activity & challenge checkpoints. * Fun Social Group, Hens Groups, Birthday Celebrations and Special Occasions in Brisbane. * Brisbane Amazing Race Champions Trophy – engraved with company details or a special message! When is your next excitement filled challenge in Brisbane, Kingscliff, on the Gold Coast or in Surfers Paradise? 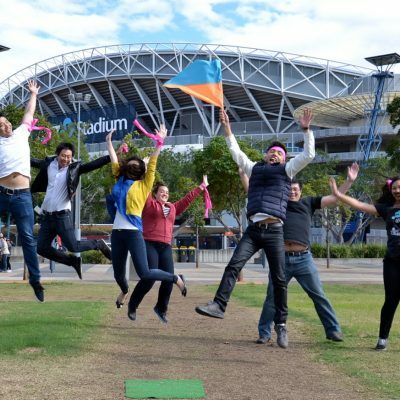 Our terrific range of Brisbane amazing race activities lets you enjoy all the “sunny one day perfect the next day” that the Queensland capital Brissy has to offer. Take a trip up to the Mt Coot-tha lookout, or experience hanging over or out on the Kangaroo Point cliffs, providing a scenic view of Brisbane down the Brisbane River. First stop is Brisbane’s Queen Street Mall. A large variety of designer boutique, department stores, all with the ability to make you look fashionably cool. Out at Fortitude Valley shopping precinct has the famous Brunswick St Mall, Ann St, James St and Emporium complex shops. Brisbane Amazing Race activities at The Wheel. Bohemium more your style – check out boutique stores and grungy second hand stores down the West End. Visit weekend markets at King George Square, Riverside, South Bank and in Fortitude Valley. 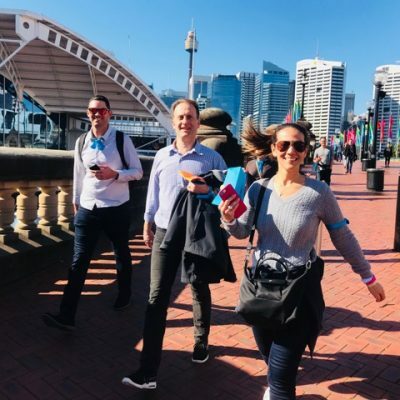 Our Brisbane amazing races makes a great base for exploring & experiencing activities along Brisbane’s South Bank Parklands, home of the World Expo 88 site. Stretching one kilometer along the Brisbane River with stunning views of Brisbane’s modern city skyline. This is a 17 hectare parkland with lots of fun, world-class entertainment providing excitement to more than 50 million visitors. South Bank is nurtures the Queensland Museum and Queensland Art Gallery GOMA. Magnificent styled artworks, interactive displays, catering for art lovers & cultural connoisseurs. Treat your taste buds, while staying in the best pubs or hotels in Brisbane. The city has a large number of restaurants and cafes throughout the city. Serving up an excellent variety of food cuisines from around the world. Sensational seafood platters are available indoors or outdoors in Brisbane. Enjoy al fresco dining & fine cuisines; spectacular feast of restaurants, diverse sidewalk cafes from Brisbane’s inner CBD city through to tranquil South Bank Parklands & Brisbane Botanic Gardens. Experience a rich cosmopolitan atmosphere in Fortitude Valley. Known as Brisbane’s West End with all the bustle of cultural smorgasboards in Chinatown. If you’re in town for corporate events, staff incentives, employee reward and business conferencing; check out WOTIF’s range of Brisbane hotels with conference rooms for your next business meeting. Stay in Fortitude Valley accommodation in the middle of Brisbane’s night life scene. Ignition Kick Off Challenge in King George Square. Stay at Kangaroo Point hotels stroll along the Kangaroo Point, cliffs and see Brisbane from a beautiful vantage. Climb the Story Bridge to experience a Story Bridge Adventure Climb. Brisbane boasts world class educational institutes includes the University of Queensland at St Lucia offering a range of academic, business and cultural educational courses. Queensland’s ‘sporting mecca’ The Gabba for state of Origin, Rugby, AFL, Soccer and Basketball are all extremely popular, and the city attracts the cream of the countries international events. Experience a range of hotels nearby Suncorp Stadium hotels nearby the Gabba. If you’re from out of town, visiting Brisbane for a Conference, Trade Show, or going to watch a Brisbane Broncos game. even Stradbroke Island, Bribie Island and Moreton Island if you dare. 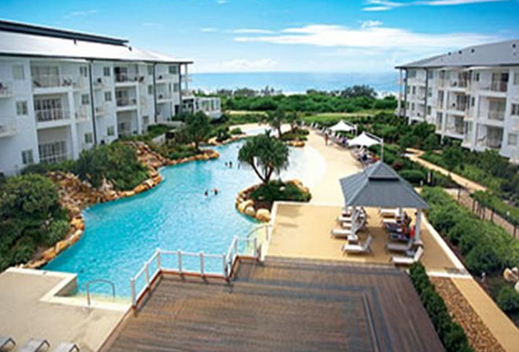 Experience the infamous Fortitude Valley, the heights of Mt Cootha or Eagle Farm and the sandy beaches of Tangalooma. 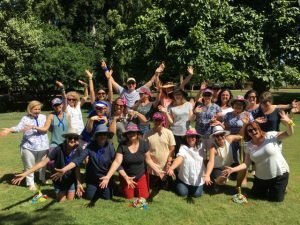 Amazing races organises a fantastic range of Team Building or Team Bonding Initiatives events and activities direct from your offices or accommodation in Brisbane. Let us take you on an outdoor journey to enjoy the Gold Coast and Surfers Paradise beaches. Or for the ultimate corporate event package seek a Thrill Experiences! Brisbane is an exciting city to explore when you know the sights. The Amazing races team have scoured the best of Brisbane CBD and surrounds developing 5 amazing race packages to select from. Ideal for corporate groups and team building where professional facilitators run the events. 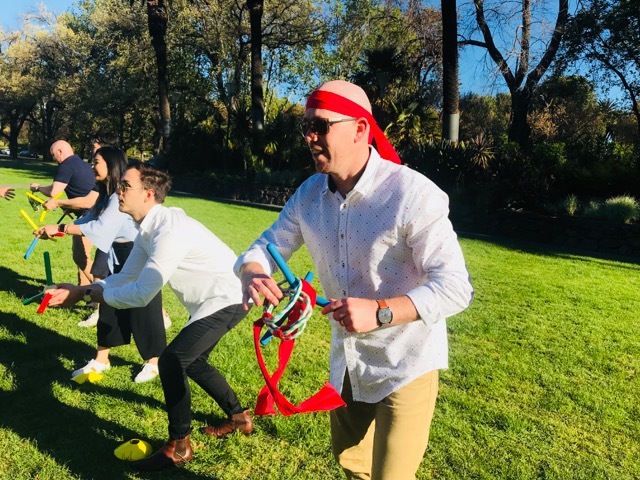 Not a scavenger hunt in disguise, but a real Brisbane fun amazing race that will have your staff and employees cheering for more.